In this form, when someone selects an item from the Marketing Menu checkbox area, another area appears below. Within some of these areas e.g. LA Times, there is an open house section, which begins with a yes/no radio button. If they choose yes, more fields for details about the open house appear below. If they choose no, these fields are not shown. 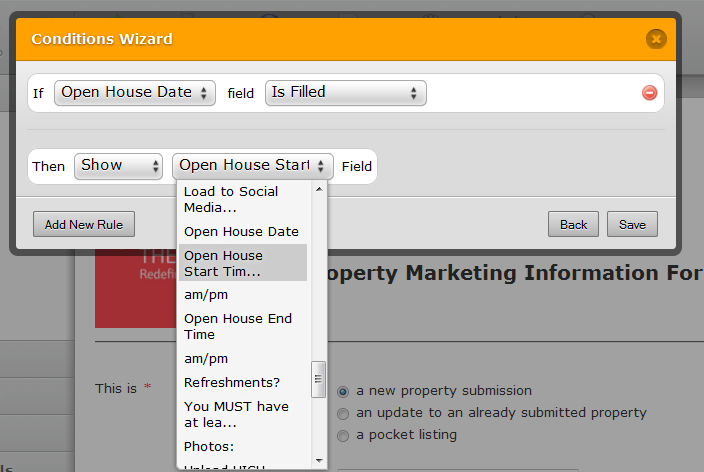 The problem: if someone chooses No for open house, then selects an additional item from the Marketing Menu area, the open house date & time fields reappear, even though No is still selected for that open house. For example, if you select the LA Times checkbox in Marketing Menu, then in the area that appears for LA Times Ad Info select No for open house, then select E-Mail Blast in the Marketing Menu, the open house date & time fields appear again under LA Times Ad Info. Kindly go through this links for more guidelines on how to solve it using using condition feature on this link; http://jotform.com/help/57-Conditional-Logic-on-Forms. You can show or hide questions depending on the choice a user chooses. Lets us know if this was of help. Thanks for your response, I've reviewed the examples and I think I have everything configured correctly. Can you take a look at the conditions for that form and let me know if I should be doing something differently? If they choose yes, more fields for details about the open house appear below. If they choose no, these fields are not shown. Thanks for your response. All of my conditions are positive. My problem is that selecting unrelated checkboxes causes my conditions to stop working. How can I fix it? Could you please tell if Form ID: 20255837295 is still giving you problems? Or did my advice worked for this one? Show "Open House Date:" if "Marketing Menu" is equal to "LA Times"
Show "Open House Date:" if "Open House?" is equal to "Yes"
You can Clone mentioned above form to see the conditions. Correcting the duplicate conditions seemed to help. Thanks!